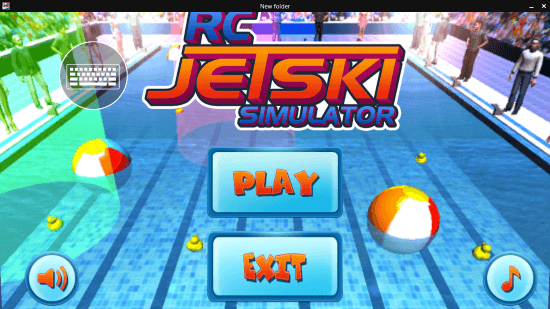 RC Jetski Simulator is a free simulator game for Windows 8 and 8.1 Computers. 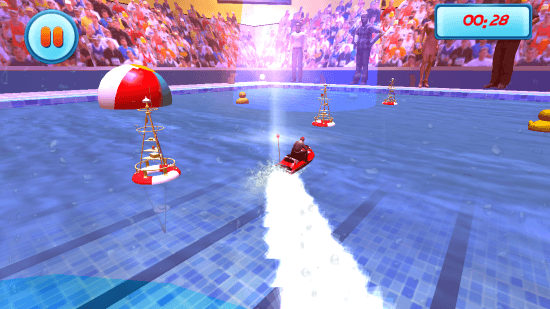 Developed by National Games 3D, this awesome game lets you drive a RC Jetski in a swimming pool to perform stunts and amaze everyone. A Remote Controlled Jetski championship is going on, and you are on the line to take the trophy away. This is for real, perform breathtaking stunts with your Jetski, win every round, and walk away as a winner. Be aware, the pool is not silent, there are waves, and other obstacles as well. Play this RC Jetski Simulator game for Windows 8, today. With a size of 42.8 MB, this simulator game for Windows 8 hardly occupies much space, and downloads pretty quick. To download and install this game, simply go to the Windows App Store, and search for the game. You may also follow the download link given below. Click on Install button, and this simulator game for Windows 8 downloads and installs automatically. To play this simulator game for Windows 8, you do not have to struggle much. The controls are pretty simple. Use the navigation keys to move around your RC Jetski. You can play this game on computers, and touchscreen tablets as well. Once you click on Play, you get an option to select your RC Jetski. There are various Jetski available to select from. All have different specifications, like Speed, Handling, and Weight. Choose your Jetski wisely. Only 2 Jetski are unlocked in the beginning. Play more to unlock others. After you have selected a Jetski to play this thrilling simulator game for Windows 8, you will have to choose a level. Now, before you actually begin to play this game, the first level lets you freely ride into the swimming pool. Ride anywhere around the pool to get cozy with the handling of the RC Jetski. Once you have successfully completed the first level, its unlocks Level 2. Now you can begin playing the game from Level 2. Go checkout yourself the thrilling experience of this simulator game for Windows 8. Unlock further levels to unfold the excitement. Perform stunts, jump through the rings, and there’s much more to do. With absolutely awesome 3D graphics, this simulator game for Windows 8 gives you a real experience of handling a RC Jetski. Sound effects are stunning as well. Stunts and the gameplay are very realistic. Install RC Jetski Simulator on your Windows 8 and 8.1 computers, and find out for yourself.